There's a very fine difference between the United States Chocolate Treasure and gelt. Note the menorah on gelt and the Jewish Star on US Treasure. The United States Treasury is a large room located in a larger cabin deep in the mountains of Colorado. The room is filled with precisely 3.8 trillion chocolate gold coins. The nation had 10 trillion coins before Ronald Reagan became President, but Reagan was notably an avid chocaholic. Reagan's theory to back up his chocaholism was that when he would stuff his face with chocolate coins some of the chocolate might trickle out of his mouth, which could feed the poor. Many conspiracy theorists believe that the United States itself does not oversee the Treasury and it's money, but it is in fact the Nation of Judaism. 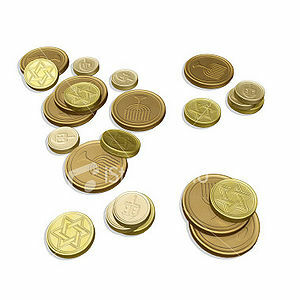 These beliefs are derived from the similarities between the nation's hoard of chocolate coins and Israel's similar hoard of gelt, located in a stone lean-to in the Gaza strip. The world's higher standing economists and scientists refute this theory with technical evidence: the USA's coinage is comprised of 38% Belgian pure dark chocolate and cut with 6 percent milk, whereas gelt is sent straight from Yahweh and grown from chocolate seeds along the Jordan river. Also, gelt is 3 millimeters longer in diameter. The day to day workings of the Federal Reserve System have until recently been shrouded in secrecy. The Federal Reserve System Headquarters are located in Washington D.C. and until recently Ben Bernanke's daily job was relatively unknown. However, The New York Times recently reported on the subject. At 11Am, Bernanke rolls into the bank in his platinum armored Maybach. He is then briefed by Elvis and Tupac on the State of his fortune. From there he goes into a back room where he smokes marijuana rolled in trillion dollar bills dipped in PCP. After that he plays monopoly, for keeps, with various world leaders while they are fellated by members of the IMF. Due to the similarities between the two nation's treasuries, the United States government is working hard to move away from the chocolate gold coin standard. Ernest T. Jackboot has recommended flipping the foil cover inside-out, so that the silver side shows on the outside. Some have even hypothesized moving to jelly beans. Regardless, the White Nationalist movement has refuted both of these proposals by threatening to bring out their Floaty Pyramid army to wreak havoc on the Rocky Mountains. The argument is still in discussion, though at the time of Reagan's administration his jelly bean loving morals nearly surpassed his strict antisemitism. Almost.